Amazing characters? Check. A setting you want to step into? Check. Science? A bit of that too. While Albert Einstein looms large, he’s not the character you’re drawn to in THE OTHER EINSTEIN. It’s Mileva Maric, the woman who will become Einstein’s first wife. In 1896, Mileva Maric, known to her family and close friends as Mitza, leaves the safety of her home to study physics at the prestigious Swiss Federal Polytechnic in Zurich. Among the few women allowed to study at the Polytechnic, she is the only female in the physics department. Mitza spent her life planning and studying for this day and is not immune to the treatment she receives from her professors and other students. Born with a defective hip, she knows her chances for a traditional life --- a husband and children --- are most likely out of her grasp. Her father encourages her curiosity and intellect, providing her with the best education possible. While Mitza never truly wanted for anything, she still deeply feels the loss of that traditional life she always believed she would never experience. "Author Marie Benedict brings to life an amazing story of a woman forgotten in the world of science, and imagines a new life for a person few remember but who may have helped change the way we think of the theory of relativity." While she immerses herself in her studies, one of her fellow students does his best to distract her. Mitza spent her life eschewing tradition, choosing science over friends and love. When a young, messy and carefree student begins to challenge her long-accepted beliefs, Mitza starts wondering if a little fun might be just what she needs. The brilliant scientist who catches her attention is none other than Albert Einstein. He treats her as an equal, something that has never happened in her studies before. He introduces her to new ideas, new people, and the most challenging discovery for her --- feeling loved. Letting herself enjoy a life she never imagined for herself, Mitza falls hard for Albert, throwing her carefully planned life into disarray. After a rather brave and uncharacteristic getaway with Albert, Mitza becomes pregnant. Without a promise from Albert and facing ruin, both in an academic and a personal sense, Mitza retreats to her family home to have the baby. It’s her mother who ultimately convinces her to go back to him in the hopes of being able to finally have a family for her daughter. Returning to Albert and believing that one day she can bring her daughter to live with them and be the happy family she imagines, Mitza soon realizes that all that was promised was a mere dream. As Albert’s star begins to shine in the academic world, Mitza’s dreams quickly fade into a nightmare, and all she can think about is the life of science she left behind. 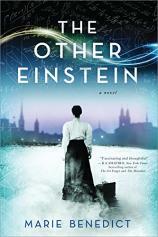 THE OTHER EINSTEIN is a heartbreaking story in so many ways. Mitza built a wall around herself and devoted her life to science. That singular devotion brings her happiness and understanding but not necessarily joy. When Albert enters her life, she opens her heart to new possibilities. It’s sad to see that fragile heart broken so easily, but Mitza’s heart isn’t as fragile as even she believes. Albert Einstein, while a main character, doesn’t drive this story, and though ever present, he isn’t always likable. Overshadowed by a well-known charismatic personality, his selfishness and sheer single focus on science are what drives Mitza away and at the same time draws her into his orbit. Author Marie Benedict brings to life an amazing story of a woman forgotten in the world of science, and imagines a new life for a person few remember but who may have helped change the way we think of the theory of relativity.